Smooth, creamy and oh so good! 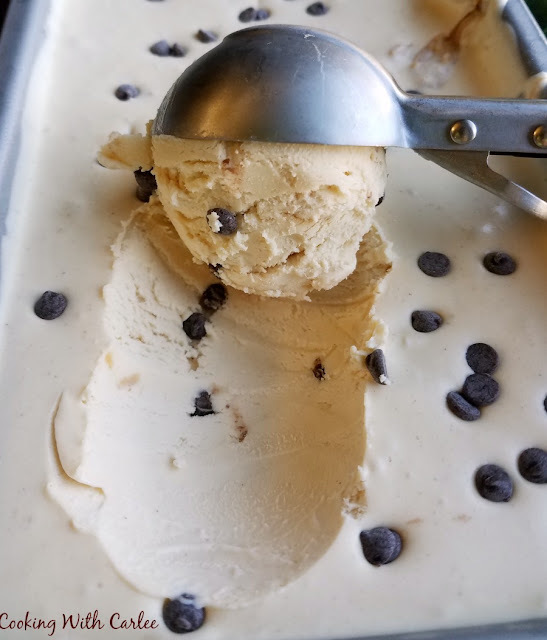 This no-churn ice cream is exploding with peanut butter flavor and is dotted with chocolate chips. It is almost too easy! To tell you the truth, I've been trying to avoid the whole no churn ice cream craze. It's not because I don't think I'd like it. In fact, it's for the complete opposite reason. You see, we love ice cream. Too much. Luckily I have self control at the store and can pass up the frozen treat aisle more often than not. If I cave and buy a tub of creamy cold deliciousness, it is unlikely to make it longer than a few days at home. The three of us all know we have to enjoy what little we get because the others may polish it off at any time, without warning. If I buy some for a party, I have to hide it in the dark recesses of our deep freezer, you know under the frozen vegetables, if I want it to still be around for its intended use. That is why until now I kept myself (and my poor jeans) protected in a cloud of purposeful ignorance. I deluded myself into believing that you needed special equipment to make ice cream. These things were best left to MiMi and her ice cream maker attachment. I could never make ice cream as good as hers. 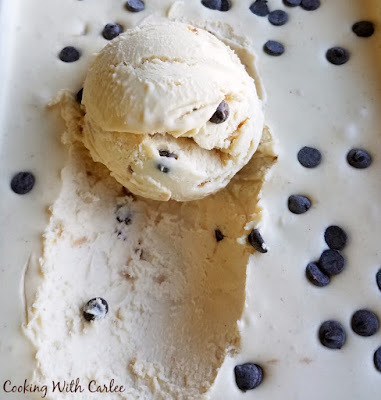 But my husband who has spent the last few months working around the clock is finally taking a much needed break and my blogging friends are hosting an ice cream social. I didn't want to be rude and skip the fun, and my husband deserves a treat. So I really didn't have much choice, did I?! While MiMi does make the best homemade cream, I am going to have to do some serious work to get back to my delusional bliss that I can't make my own ice cream. So please send your condolences to my skinny jeans and wish my fat jeans luck. It could get interesting! I thought it would be fun to make an ice cream using our favorite flavors, chocolate and peanut butter. I didn't want the peanut butter flavor to get lost, so it's in the ice cream base and there is a ribbon of extra peanut butter goodness throughout. A few mini chocolate chips add a fun texture and that little bit of chocolate. For more chocolate goodness, drizzle with hot fudge. You know we did and it was amazing! And as an added bonus, you'll learn during the process that you can make peanut butter whipped cream. Don't be surprised if I come up with a hundred ways to use that in the near future! 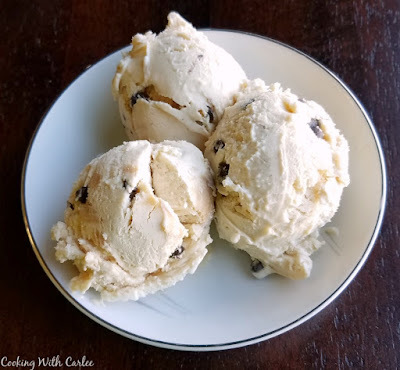 Now grab a bowl and enjoy a scoop of this luscious peanut buttery goodness while you read about all of the other treats my friends made for our virtual ice cream social. This ice cream is full of peanut butter flavor. It is smooth, creamy and oh so delicious! Whipping the cream will work best if you chill the mixer bowl and peanut butter for a little while first. Of course you want your cream as cold as possible as well. Just stick it all in the fridge until you're ready to go. Whip the cream, peanut butter and vanilla until it holds stiff peaks. Fold in the sweetened condensed milk until combined. Then stir in most of the chocolate chips. Pour into a large loaf pan or other storage container. In a small bowl, stir together additional peanut butter and cream to loosen up the peanut butter a bit. Drop small spoonfulls on top of ice cream and gently swirl with knife to distribute. Sprinkle with remaining chocolate chips. Freeze for at least a couple of hours or until set. Serve with hot fudge if desired. They are so good together! Enjoy! I am surprised that the cream whips up with the peanut butter in it. That's fun to know. I know, I can't wait to use that on other things! Now this is my kind of ice cream! Chocolate and peanut butter....does it get any better! Mine too! It's hard to go wrong with that combo! This is very very dangerous information for me to have... Thank you! Is it wrong to want it all for myself? It does look so creamy and delicious. I'm sure your hubby enjoyed the treat. Yummy! That sauce is da bomb! Why would anyone buy ice cream when you can make so easily make it yourself? It's almost crazy how easy it really is! Probably too easy for me and my sweet tooth! I am terrible at whipping cream.. but I am willing to fail to try this one! My favorite flavors! Can't wait! THanks for sharing! You can do it!! Cold bowl, cold beaters, cold cream and a bit of patience! This looks like the perfect summer treat, Carlee. So creamy! Oh my.....I don't know how you are going to resist making a batch each week....I know I couldn't. It's going to be a struggle! This looks fantastic, Carlee. Thanks for sharing this recipe. 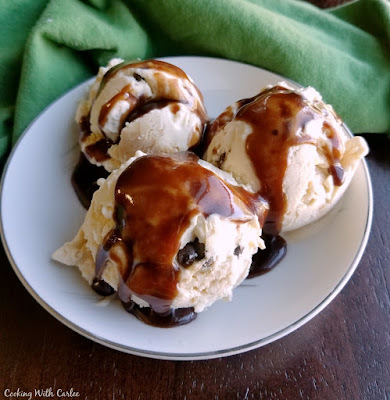 I love peanut butter and chocolate, so I'll have to try this ice cream recipe soon! This looks so beautifully creamy! Yum! I am a HUGE fan of peanut butter and ice cream. I just have to limit my ice cream because my body doesn't like it. This looks absolutely DELISH! Hi Cralee, I have never tried a no churn ice cream, mainly because I do have a cheap and cheerful ice cream churner, but I'd also worry about the texture of the ice cream not being ice cream like. Peanut butter and chocolate do go well together and your ice cream seems nice and simple (I had been toying with the idea of trying to make a peanut butter custard base for an ice cream, but that now seems like too much hard work). There is peanut butter on special in Lidls this week, so I think it was meant to be! Now you have me wanting to beg my mom to churn up some sort of peanut butter custard. I don't trust myself to make too many ice cream recipes without blowing up like a balloon. There's no way to stop myself from eating too much! I agree with you. We love ice cream too much, but now that you've shared the secret with me I'm afraid that there will be no turning back! I love the peanut butter in this. I saw this on Think Tank Thursday. It has been shared and pinned. Thank you for sharing. It's terrible and wonderful all at the same time, isn't it?! Thank you so much! oh, my, you are my hero! My family has been asking for homemade ice cream but our freezer broke last year. I am pinning this and surprising my family. stopping by today via Think Tank Thursday. Hooray! I love being a hero! I hope you and your family love it! I can't wait to try your recipe, Carlee. It sounds easy to make and looks delicious. Thanks for sharing at Snickerdoodle. We'll be featuring this at today's party. What a great Ice Cream, we will love it! Thanks so much for sharing with us at Full Plate Thursday, have a great weekend and come back soon! Thank you, Miz Helen! I hope you had a great weekend! I have been dreaming about this ice cream. Ha! I can see why! This recipe would do away with the skinny jeans! I love that you have the ribbon of peanut butter going through. Perfection! This ice cream looks dangerous! I better not make any for my husband or I won't be able to stop. Peanut butter and chocolate and condensed milk and heavy cream. Decadence!!! It's totally worth it, I promise! This is so perfect for the summer heat. Thanks for sharing it on Merry Monday. Will be including this in an ice cream round-up for the party. Thank you so much! I want to try all of those ice creams!